You must be using FL Studio Producer Edition or higher. Windows: An ASIO audio device driver must be selected for your audio device (press F10 to open the options settings, select Audio and select an ASIO driver). macOS: From macOS 10.14 (Mojave) onward, FL Studio must have permission to access your microphone. Open 'System Preferences > Security & Privacy > Microphone'. Enable microphone access for FL Studio. The recording filter (shown above) must be set to record audio (Right-Click the record button ), if you are recording to disk (Playlist recording). An audio source must be connected to your audio device audio input/s (DOH!). The active audio device input/s (from 4. above) must be selected on the Mixer track input menu. 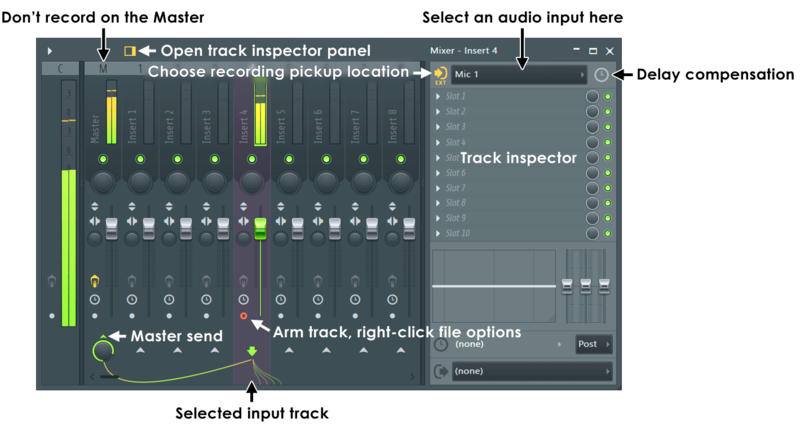 The Mixer track must be armed to record audio (see Playlist recording) OR if you are using Edison, it must be set to record audio on the input Mixer track (see Edison recording). Where does external audio enter FL Studio? - Select external audio from the Mixer Input menus (shown above). Each Mixer track can receive one external stereo audio input. The Input menu displays a drop-down list from your selected audio device/s (mic, line, etc). 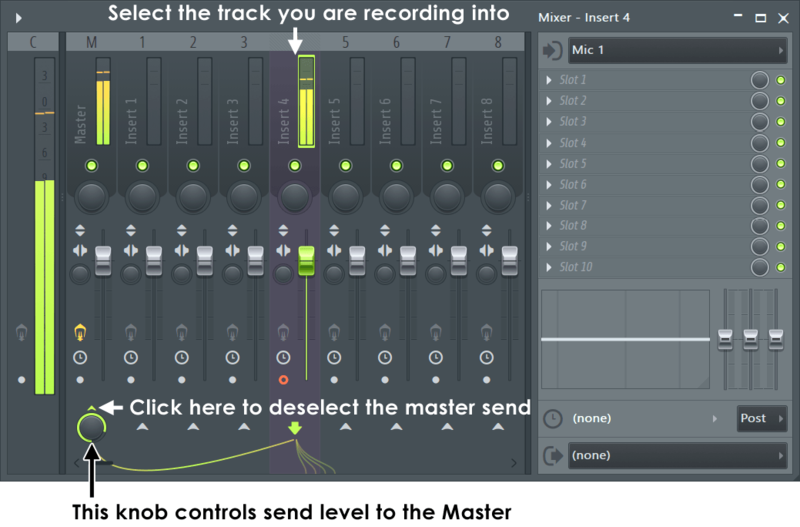 The screenshot above shows the audio device microphone (Mic 1) selected on Mixer Track 4. If you have more than one audio input to record, use multiple mixer tracks to receive each input. Click the icon in front of the Input menu to choose Pre vs Post effects recording. NOTE: On Windows, Input options will only be available if an ASIO audio device driver is being used and macOS you may also need to Aggregate your Audio Devices. Playlist - 1. 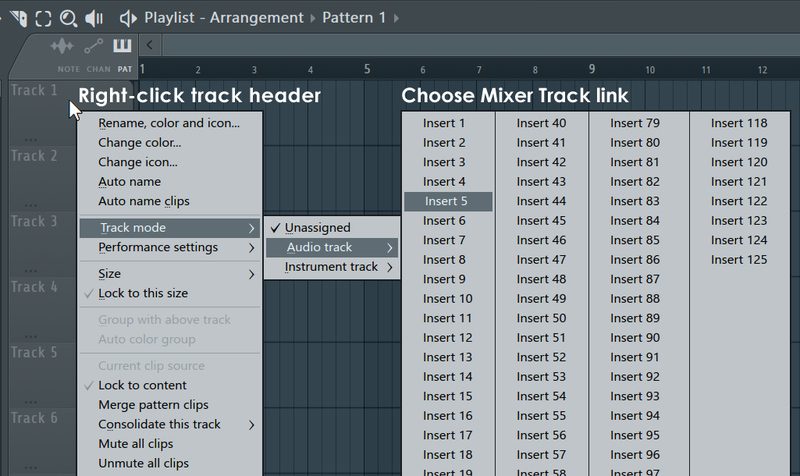 Associate a Playlist lane with a Mixer track by Right-clicking the Playlist track header and selecting - Track mode > Audio track > Insert (link to the desired Mixer Track). 2. Arm a Mixer track by clicking on the disk recording icon (see screenshot above). Edison - Place an instance of Edison in the Mixer track receiving audio and record into memory (see screenshot above). Edison is best when you are experimenting and plan to make multiple takes such as when 'Loop Recording'. In this case region markers are automatically placed in the recording each time FL Studio loops back to the beginning of the project. Regions (loops) can then be dragged into the Playlist. Use these methods to record external sources, internal sources or a combination of both. For details, see below. Why do I hear music/percussion along with my recording - You are recording on a Mixer Track that has other internal audio routed to it. If you record on the Master Mixer Track, that will include every other Mixer track in the project! Make sure no Channel Rack instruments or Audio Clips are routed to your external Input recording Mixer Track. Why do my recordings come from one speaker? - FL Studio records a stereo input, since all Mixer tracks are stereo. You are probably feeding your audio-interface a signal that only appears on the left or right channel of a stereo input. Solution: The Mixer INPUT menu has an upper stereo list and lower mono list. Select your input from the lower, mono INPUT list. This will copy the active channel into the silent stereo channel so audio comes from both speakers. How do I record multiple independent inputs (multi-track record)? - All Mixer tracks can be armed to record external and/or internal audio sources to disk (see Playlist Recording below). It's possible to, simultaneously, record the full number of audio inputs on your audio device. NOTE: Right-Click the Mixer Input menu to initiate an 'Auto-map'. This will automatically map each input on your audio device to a unique Mixer Track Input, starting on the Mixer track where the Auto-map was initiated and working to the right. To prevent feedback, the Master Tack send (click here for an oversized and obsessive diagram) will be disabled on each Mixer Track, so you will see input activity on the Peak Meters, but won't hear anything. How do I record using multiple audio devices at the same time? - For example, how to use a USB microphone Input and your regular audio device Output, at the same time. Windows: FL Studio ASIO allows you to select one Input and one Output from separate audio devices. ASIO4ALL will allow you to select multiple Inputs and Outputs from separate audio devices. macOS: Use the Aggregate audio devices feature under the Utilities folder in macOS, this has similar capabilities to ASIO4ALL as described above. How do I record my hardware synthesizer/drum-machine/sampler? - To use sounds from an external synthesizer, while it is played by FL Studio, you will need to make MIDI connections AND audio connections to your audio device inputs. FL Studio can record the sound/s (discussed below) as it plays the external MIDI hardware using a MIDI Out plugin. Can I record using a USB microphone or headset? - Yes, USB microphones may require some additional setup discussed here. How do I set the recording bit-depth - FL Studio receives audio from the audio device as a pre-digitized stream, the '32 bit float recording' option set in the Mixer menu > Disk recording save option has no effect on the incoming recorded bit-depth (only the save format). Recording bit-depth is set in the audio device's own options and is shown in the hint bar when selecting items from the mixer input menu. Windows:, right-click your volume control icon on the Windows task-bar, select 'Recording devices'. Select your input device and 'Set as default' then select 'Properties', then 'Advanced' and choose 24 bit 44100 Hz option if available OR 16 bit 44100 Hz if not. macOS: Use the Audio MIDI Setup options. Why aren't my audio recordings correctly aligned with the Playlist grid? - In cases where audio drivers are not accurately reporting their position to FL Studio, you may need to adjust the Playback Tracking options. USB microphone & headsets appear as separate audio devices apart from your main audio device. To use two, or more, audio devices with FL Studio: Windows - Follow the steps in the section Recording USB audio-inputs OR for macOS - Use the Aggregate audio device feature under the Utilities folder. There are two main ways for recording external audio explained below, the first method records audio as an Audio Clip in the Playlist. The second records to the Edison plugin, loaded onto the Mixer track of your choice. While this section looks complex, with many steps, it details the full external-audio to Playlist recording step-by-step procedure and all options. Once you understand the process it only takes a few mouse-clicks to record external or internal audio. Playlist lanes are not initially bound to audio inputs, as is common in other DAWs. Audio is recorded through the Mixer, to disk, and the recording is automatically placed onto the first Playlist Track where it won't overlap with existing content. You can link a Playlist Track to a Mixer Track audio input by right-clicking the Playlist Track header and choosing 'Track mode > Audio track > Insert ...' to associate it with a Mixer Track, as shown below in Step 3. Recordings will then appear as Audio Clips. External audio is recorded from Mixer track Inputs. Recordings appear in the Playlist as Audio Clips. As Playlist tracks do not initially represent specific Mixer tracks, it doesn't matter what Playlist track the Mixer track is associated with, or what Playlist track the Audio Clip subsequently moved to. Pre-requisites - The pre-requisites for external recording must first be satisfied (as described above). 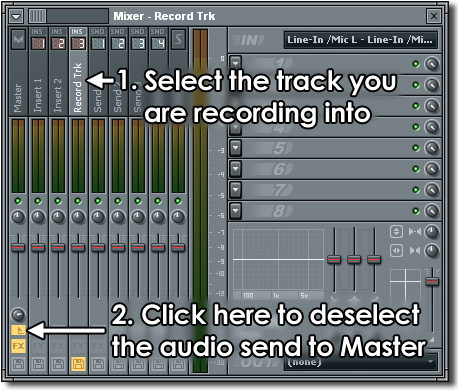 Don't record on the Master Mixer track - Choose an unused Mixer Track. Instruments, Audio Clips and other Mixer Tracks routed to the Mixer track you record on, will be mixed in with the external audio input. The Master Mixer Track has all other Mixer Tracks routed to it, so it's not the place to record external audio. Link a Playlist Track with a Mixer Track Input - Right-click the Playlist Track Header and choose Track mode > Audio track and then Mixer Track to receive audio from (shown below). All recordings from this Mixer Input will appear on the linked Playlist Track. Subsequent recordings, made on the same Mixer Input, will appear as sub-tracks to this parent. All 'Audio Track' inputs default to PRE effects recording and the Audio Clips are routed back to the originating Insert Mixer track. TIP: If you are recording in Audio Track mode and need to make multiple takes, select Loop record and deselect Blend record so recordings are muted when you press stop. This prevents previous recordings interfering with the next take. Alternatively, manually mute previous Playlist Tracks before recording the next pass. Choose an external input (see below) - The options in this drop-down menu will depend on your audio device. Most audio devices have at least one Mic and one Line input, however you may need to experiment to find the input that carries your external audio. 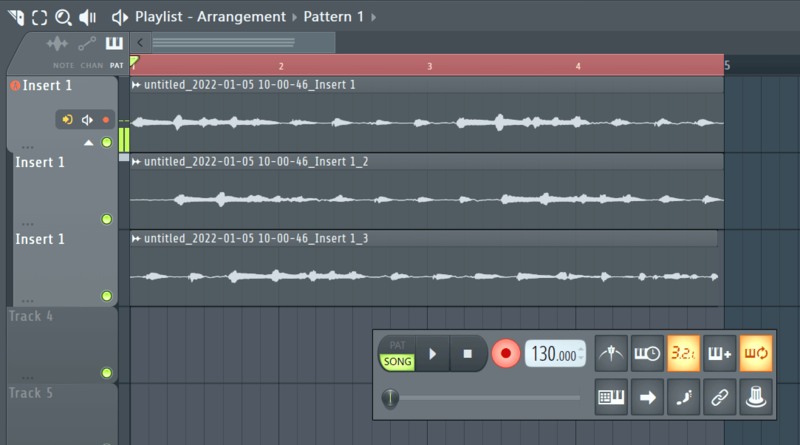 Selecting an input will auto-arm the track for recording, as indicated by the red track recording icon. If you want to use a USB mic or headset to record audio, follow the steps outlined here first. Pre effects mode (preferred method) - Audio is recorded without effects. Audio Clip routing - After recording (Audio Track & non-linked modes), the Audio Clip is routed back to the Mixer Track it was recorded from, and so it will play with any live effects present on the Input Mixer track. Post effects mode - Recordings will be imprinted with any effects active on the Input Track. Audio Clip routing - After recording (Audio Track & non-linked modes), the Audio Clip is routed back to the Mixer Track it was recorded from, and so it will play with any live effects present on the Input Mixer track (if they are present this will double the FX, so mute them). After recording (non-linked mode), the Audio Clip is routed to the same Mixer Track the Input Mixer Track was routed to (usually the Master), to avoid doubling effects. Make sure you have a specific reason for 'post effects' recording, since the effects will now be part of the recording and can't be undone. NOTE: If the recorded audio is late, or early, relative to other Playlist events, use the manual Input Delay Compensation icon to adjust this on a per-input basis. Positive values to move the audio to the left (earlier) and negative values to shift recorded audio to the right (later). See Audio INPUT delay compensation for more information. There is also a global control for changing recorded input alignment on the Audio Settings > Playback Tracking > Offset. Mono inputs - If you have a mono sound source that appears in only the L or R stereo channel, you will notice that the input options are divided into 'Stereo' in the upper section and 'Mono' in the lower section. By selecting the Mono version of your input, FL Studio will record the signal into both the L and R Mixer channels. Naming & save location (optional) - If you want to select the name and location of the saved .wav file as something other than the default then Right-Click the Mixer track recording icon to open the file-name/location dialog. Select a location in the browser dialog and name the .wav file to be recorded. If you use Left-click, an automatic file name will be assigned to the track. Do the same for all Mixer tracks you want to record. NOTE: Setting a custom record location folder from the F10 > Project > General Data folder setting, will mean the default location is set by you. Auto-create audio clip - This should be on by default. An Audio Clip will be automatically created in the Playlist. NOTE: Automatic Audio Clip placement only works in Song mode. Latency compensation - Turn ON. This removes an amount of time equal to the audio device latency (buffer length) from the start of the recording, ensuring the audio is aligned with the internal Playlist events. If the recorded audio still does not seem to be in sync, you may need to adjust the Playback Tracking options. Start with the 'Playback tracking source' options, but if these don't work you can manually set the 'Offset'. NOTE: This setting does not affect the live (monitored) sound, only the recording and doesn't have anything to do with the PDC delay panel (C) options. See the point below on 'Monitoring' for ways to improve latency delay on the live audio passing through FL Studio. Bit-depth - This is the saved bit-depth and is the resolution of the waveforms amplitude quantization. '32-Bit floating point recording' is only necessary if your audio device is set to record at a bit-depth higher than 16-Bit so use the 32-Bit setting to save files recorded at 24-Bit. NOTE: FL Studio receives audio from the audio device as a pre-digitized stream, the bit-depth set in the Mixer has no effect on the recorded bit-depth (that is set in the audio device's own options and is shown in the hint bar when selecting items from the mixer INPUT menu). Saving a 16-Bit sample at 32-Bit will make the file significantly larger with no gain in quality. Windows: Use the Windows Recording Device Properties options or the options in your ASIO Device Driver. macOS: Use the Audio MIDI Setup options. Routing - Stop the incoming audio passing back to the audio device by de-selecting the 'Send to master switch/knob' from the Mixer track you are recording into. Remember, with the recording track selected, the send knob is located on the Master track, not the selected track. The downside is that you can no longer 'monitor' the recorded sound, although you can move one headphone cup an ear (DJ style) and listen live. However, if you Audio Interface has 'Direct Monitoring' see below. Direct Monitoring - Use 'direct monitoring' if supported by your audio device. Direct monitoring is achieved completely in hardware, routing a copy of the input signal directly to the audio device outputs, and so eliminating latency caused by the software buffer. NOTE: If you use direct monitoring it will be necessary to apply the routing solution (in this paragraph), to prevent input to the FL Studio Mixer being heard. Finally note that direct monitoring isn't common on basic (consumer level) audio devices, so consult the audio device manual to see if it's available on your card. No manual? The direct monitoring options are usually found in the factory Mixer associated with the audio device driver. Many external USB/FireWire audio devices have a hardware knob or button labeled 'Direct monitoring' or 'Monitor'. Latency - If you don't have Direct Monitoring and you need to monitor your input signal, try lowering the buffer settings and see if the echo can be eliminated or reduced to acceptable levels. Of course there are limits to how low the ASIO / Core Audio buffer can be set. Recording with effects - Click the icon at the front of the Input selector so it shows POST effects recording. HOWEVER! We STRONGLY recommend recording all incoming audio WITHOUT EFFECTS and adding them later as this provides maximum flexibility. To monitor the incoming signal with effects while recording without effects, click the icon at the front of the Input selector so it shows PRE effects recording. This ensures that the audio is recorded dry, but is still monitored with effects. After recording, the Audio Clip will be automatically routed back to the original input track so it plays with the same effects. The Record Button: Prepare for recording. There are two functions associated with the Record button on the Transport Panel. Recording filter - There is a recording filter pop-up menu, Right-Click the Record button and make sure 'Audio' has a tick (all data-types with a tick will be recorded, click to select/deselect items). NOTE: Mac users, since macOS Mojave you must also give FL Studio permission to access your microphone. Arming - Left-click the record button to arm for recording. The button will light to indicate that record mode is activated (orange). NOTE: Don't forget that Insert Mixer track also has a recording switch that must be armed. In this way, you can leave many Mixer Tracks armed and disable recording from the Master Recording button. Start recording - Finally! Press the Play button to start recording. Stop recording - When you are finished, press the Stop button. If you want all armed tracks to unarm enable the 'Disk Recording > Auto-unarm' option in the Mixer popup menu. If tracks remain armed and you press record again new Audio Clips will be created leaving previously recorded Audio Clips intact. Where's my audio? - If you are in Song mode AND the Mixer menu setting, Auto-create Audio Clips is on, your recording will appear as an Audio Clip wave display in the Playlist window. If you are in Pattern mode, the recording will appear as an Audio Clip Channel. Audio Clip placement - If you have not specifically linked a Mixer Track to a Playlist Lane, Audio Clips will be placed in the first track with enough room to fit the Audio Clip, without overlap with existing Clips, although you can move it anywhere you like afterward. To ensure your Audio Clips are placed sensibly, we recommend using the Audio Track method described at Section 3 above. 3. If you have set a custom record location from the F10 > Project > General Data folder setting, your audio files will be there. Audio Clip Mixer track routing - See Section 3 above. Playlist & Sound-on-sound method - You can Loop record all or at any part of the Playlist by making a time selection and hear previously recorded loops for 'sound-on-sound' recording. Do not use Audio Tracks - Since Audio Tracks route the recorded Audio Clip back to the same Mixer Track as you recorded from, this will cause previous loops to mix with the next recording in the loop. You can deselect 'Blend recording' (see below) to avoid this, but then you won't be sound-on-sound looping. Select Loop record mode - The switch is on the Toolbar Shortcuts. Select 'Blend Recording' from the Toolbar Shortcuts. This will mean each loop recording will be audible. When this is off previous loops will be muted. Select Song mode - From the Transport Panel. Make a Playlist selection (optional) - If you want to Loop record over a section of the song, highlight the time-line section in the Playlist. Hold (Ctrl + Left-click) and then drag along the bar-count at the top of the Playlist. If you don't make a selection then the whole song will Loop record. Monitoring options - To mute loop recorded Audio Clips switch Blend recorded notes Off. To hear loop recorded Audio Clips, turn it On. Arm record mode and press Play to start recording - When FL Studio reaches the end of the Playlist data or selection it will dump the recorded audio to the Playlist as an Audio Clip and loop back to the beginning of the selection to start recording a new Audio Clip. NOTE: Each time around the loop FL Studio must save .wav files, create channels and new .wav files. On some systems there may be audio glitches in the first few ms of each loop. Adding a bar lead in at the start of the loop section where you are not performing input audio will avoid this problem, should you experience it. Setting a custom record location folder from the F10 > Project > General Data folder setting, will send any recorded audio files to this location. If your audio device does not have factory ASIO drivers, use FL Studio ASIO or the ASIO4ALL driver. ASIO4ALL allows you to aggregate multiple input devices and record from several sources simultaneously (for example; a USB microphone and your Audio Interface). Edison will record audio from any FX slot into which it is loaded. This makes it a handy tool for sound-design and general recording duties where you are not specifically wanting to sync the recording with the Playlist. 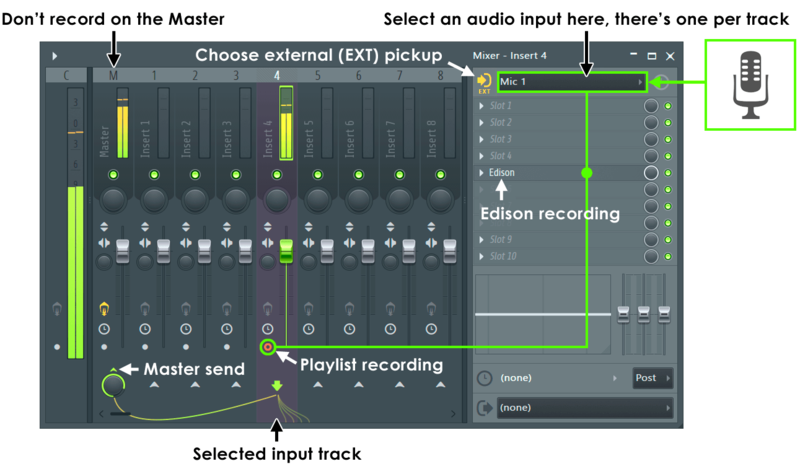 Load Edison - Load Edison in an FX slot in the Mixer track that you want to record. Don't use the Master track (all audio from all tracks is routed here). TIP: Select the Mixer track and press (Shift+E) to auto-load Edison in the first empty FX slot on the track ready to record. Input selection - Select an external input (see below). Loading Edison before selecting an input will disable the auto-arming of the disk-record function. It is possible to turn this back on (if you wish) by clicking on the Mixer track record icon associated with the track you are using. Effects - Place Edison before any effects loaded in the same Mixer track for a 'dry' recording. It is recommended to record all external audio dry as this gives you the opportunity to add and change them later on. Record using Edison - Click here to see the Edison help and normal recording setup options. You will be able to record into Edison, where it is stored in memory, and then export the audio to a sample or Audio Clip. Left-click: Send to Playlist as Audio Clip (Shift+C) - Dumps the selection to the Playlist as an Audio Clip. Right-Click: Send to selected Channel - Dumps the selection to the selected Channel. Drag / copy sample / move selection - Left-click on the button and drag to the desired location (e.g. Playlist Clip-track). The selected region in the Sample Edit Window (or whole sample if no selection is made) will be copied and moved to any compatible location in FL Studio. Apart from the Playlist other locations may include Sampler channels, Fruity Slicer, DirectWave, etc. Right-Click to copy the selection to the clipboard. Save and load - Save the audio/selection to a file and re-import it through the Browser. NOTES: 1. Take the time to read the next section on Mono inputs (3.4) and Monitoring (3.7) as they are also relevant to Edison recording. 2. Memory considerations: Edison records into RAM and so is not suited to recording hours of continuous audio. Edison uses approximately 20 Meg of RAM per minute of recording. If you need to record for more than 15 minutes then the Playlist (disk recording) method is recommended (see below). Load Edison - Select a Mixer track and press (Shift+E). This loads Edison in the first empty FX slot ready to record with 'Slave playback to host' and Record 'On play' enabled. Select your input - Select your live audio input from the Mixer INPUT menu. Make a Playlist selection - If you only want to record a section of the song, highlight the section of time in the Playlist, hold (Ctrl) and then click and drag along the bar-count at the top of the Playlist. If you don't make a selection then the whole song will Loop record. Start recording - Press Play in FL Studio and record as many takes as you need into Edison. Each time Edison loops section Markers will be placed in the recording (these are useful for later). Stop recording - Stop FL Studio and click on the record button in Edison to disable it. Start playback - Press Play in FL Studio and the first take in Edison will play in sync with the Playlist (slave mode is on), looping when the Playlist does. Audition takes - With Edison focused use the left and right arrow keys on your keyboard to select a different takes in Edison. Each left/Right-Click will jump to the next/previous section. Send the perfect take to the Playlist - Press (Shift+C) to send the current selection in Edison to Playlist. NOTE: Edison will automatically set the sample properties to the current project tempo so that the recording will stretch as the project tempo is changed. NOTE: The Edison method does not allow for 'sound-on-sound' recording where layers of audio are built up on each pass, for that use the Playlist method, below. FL Studio allows you to record the output of one or more Mixer tracks to .wav files and to auto-insert them as Audio Clips in the Clip Track area (optional). 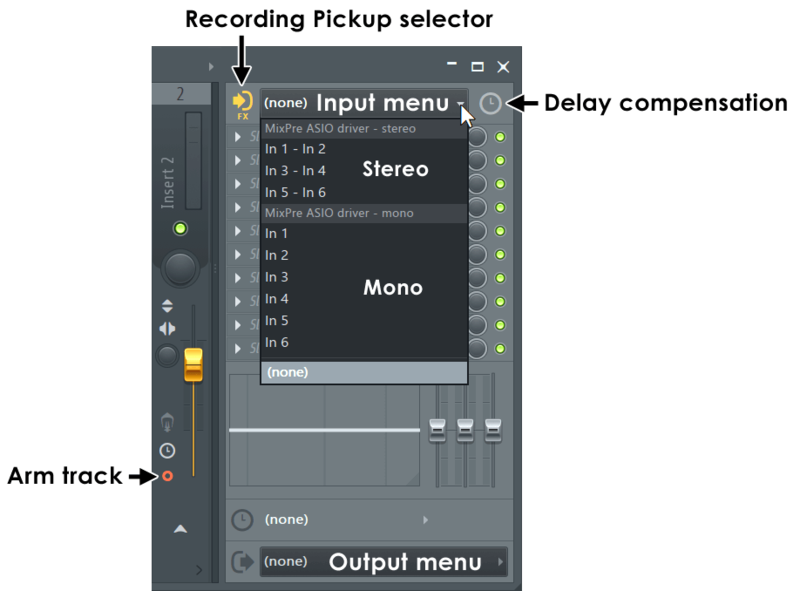 There are two ways to record a track - non-realtime recording, which results in the highest audio quality and realtime recording (interactive) that allows recording of ASIO inputs. To perform non-realtime export of Mixer track/s, also known as 'track freezing' and auto-create an Audio Clip. See the Playlist section of the manual on Consolidating Clips. Alternatively, use the 'Split mixer tracks' option on the Export project dialog that will create a .wav file for each active Mixer track in the project. Great for creating track stems when importing audio into a 3rd party application. Select your recording location - Either load Edison into an FX slot of the Mixer track you wish to record OR for Disk/Playlist recording Arm Mixer tracks by pressing the disk icon. Disk recording - If you are recording to the Playlist then turn OFF the Mixer menu > Disk recording > Latency compensation option. There is no latency for internal audio sources. Effects - In the case of Edison, you have the option of placing multiple instances of Edison on the same Mixer track, with or without other effects loaded before or after each instance. In this way you can record dry and wet (with effects) versions of your Mixer track audio (to record a dry version, make sure Edison is in slot #1). In the case of disk recording any effects on the track will be recorded, if you don't want this, disable the effects now. Record - Click here to see the Edison help and normal recording setup options. You will be able to record into Edison, where it is stored in memory, and then export the audio to a sample or Audio Clip. For disk recording the process is as described in the sections above, however this time it is internal audio that is recorded. Full descriptions are available on the main Mixer page. NOTE: Most controls are automatable (Right-Click and select 'Create automation clip').